LIVERPOOL, United KingdomEarly adopters of the new HARMAN Soundcraft Vi5000 and Vi70000 digital mixing consoles continue to emerge as Adlib Audio, one of the UK's top live sound providers and a longtime Soundcraft partner, has added Vi7000s to its inventory and upgraded their existing rental stock as part of Soundcraft's certified Vi upgrade program. 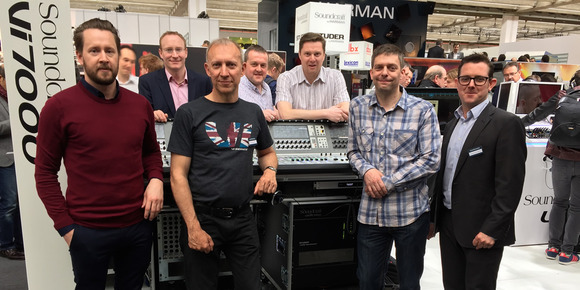 Adlib purchased these consoles through Sound Technology, Soundcraft's UK distributor. Adlib have a busy summer for the consoles and are looking forward to deploying one of their Vi7000s later in the year on the live production of "Mrs. Brown's Boys – How Now Mrs. Brown Cow" - the arena touring version of the popular television sitcom that stars writer and performer Brendan O'Carroll. The Vi5000 and Vi7000 provide a choice of compact control surfaces with new local rack and active breakout box hardware, delivering simultaneous mixing of up to 128 inputs and 32 mono/stereo busses with up to 384 inputs and outputs in the I/O system allowing unlimited record feeds from all channels. Pristine sound quality is assured with ultra-low noise microphone amplifier designs and enhanced 96kHz 40-bit floating point digital audio processing, with the first ever digital implementation of the classic BSS DPR901ii Dynamic EQ adding to the channel processing armoury, while effects contain eight independent Lexicon multi-FX units, and a BSS graphic EQ on every bus output. "Our Vi6 consoles have performed exceptionally for us, the increased I/O and ability to mix in 96k made this upgrade an obvious one for us," said Dave Kay, Director of Adlib Audio. "We have also loved working with the DPR901ii in the past and are very pleased to see it integrated into the Vi7000." "I've always loved the ease of use and the amount of visual feedback that the Vi user interface gives to the engineer, the new features have been integrated very subtly in to the existing interface, so moving forward it isn't like you have to learn a new console with a different layout. Show compatibility is retained and this makes it a very simple transition in either direction with the new models," Kay added. Soundcraft's Global Sales Director, Dom Harter added, "The highly successful Vi4 and Vi6 consoles will continue to be offered for sale and ongoing support in the same manner as the rest of the Vi Series. Additionally, existing customers can benefit from the Vi4/Vi6 upgrade package to a Vi5000/Vi7000 system, details are available from local Soundcraft distributors."